VERY INTERESTED. But sadly the “Buy Now” link just takes me to my Paypal main screen and not to a specific transaction. WordPress rewrote the form data. It should work now. If you’ve got a YA grouping, I’ll take it! I’ll have to check, but I don’t think we had many YA paperbacks. ok! Will keep checking back just in case. Still contemplating the fantasy novels though. would love that even more if I could know that plots were middle grade/YA appropriate, even if reading level isn’t. My kids reading levels are through the roof. it’s hard to find books that are at their reading level but still appropriate for their young minds. Aw hell…. I just can’t resist owning ALL THE BOOKS!!!! Buying the fantasy set now. Would still buy a YA set if you had it. annnnd…. I’m a sucker and in for the sci fi too. Still up for the YA if you’ve got it. I think my order went through, but paypal redirected me to a message about my session expiring, so let me know if I need to try again. Not a problem. Seems to have happened to a few people. Will try to remember that! Thanks! Hmm. Just ordered the SF bundle, but got a weird notice that my session with Wyrm Publishing could not be reestablished — yet Paypal sent me a receipt. Should I be worried? That’s happened to a few people. Everything should be fine though. Have updated the post to warn people about this one. Oh no! I just checked my paypal receipt and the address is an old one! How can I change that? Help! Email me at neil at clarkesworldmagazine.com. I can change the address on my end. 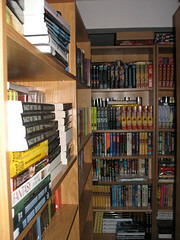 That said, I don’t think I have many, if any middle school-level paperbacks. If that’s a problem, I’d be happy to issue a refund. Ok. Haven’t read these, so I’m not sure what’s in them. Will do what I can. Neil, if I were to order some books and gave you a mobile library’s address, would you be able to ship it to them? I’m sure they’d appreciate it. Please let me know. Thanks! That’s such a cool idea! Definitely willing to ship to them. Will toss in a few extras too. Im checking with them to see if they’re ok with adult spec-fic (i think they cater to teens mostly). If you have teens/MG/YA or if they give the green signal for adult, it would work out great. I’ll keep you posted. Thanks for this. I never had much YA stock. Didn’t sell well for me and a good chunk of what there was sold off at conventions. Should you do something similar with mysteries I’d be quite interested.